The 1999 winner of SABR's highest honor, the Bob Davids Award, is David Vincent. Among his services to SABR, David is the keeper of the Home Run Log. With all due respect to some of SABR's luminaries of the past and present, last year, the Year of the Home Run, David probably became our organization's most visible member ever. I remember sitting at home one night toward the end of the season with my wife watching the network news when, who should appear on the screen but David, sitting at his computer, which I presume held the Home Run Log, and reeling off facts and figures about home runs and the McGwire-Sosa race. David was on for two or three minutes – an unconscionably long time, given that TV likes to do its work in sound bites of about 5 seconds. I remember thinking that he won many friends for SABR that night. David was also a leading force in production of the SABR Home Run Encyclopedia. But home runs are not his only stock in trade. He served on the SABR board from 1993 to 1997, a period in which he helped guide our society through important financial decisions. He has lent his computer expertise to the SABR office in Cleveland, among other things setting up the membership database and writing programs to make it useful. At the local and regional level, David was the coordinator of the Bob Davids Chapter for several years, and, a member tells me, kept the chapter moving forward at a time when nobody else was willing to do the job. Those are only a small sample of the service David Vincent has provided willingly to all of us over the years. 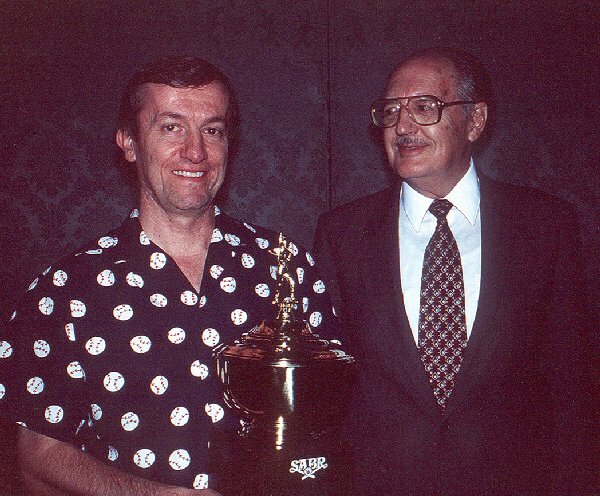 Fellow SABR members, it's an honor for me to present the Bob Davids Award for 1999 to David Vincent.